Are you interested in feeding your family from your own home garden? It’s deeply satisfying to know your meal was cultivated by your very own hands… from sourcing and saving seeds to building up fertile soil to capturing rainwater that nourishes your crops. They’ll show you everything you need to know — from seeds to soil to irrigation to canning and preserving. They’ll also guide you in step-by-step best practices for raising chickens, beekeeping and more. And, they’ll share how you can make herbal remedies from your own garden and advance grassroots healthcare initiatives. Plus, if you’re passionate about living in the healthiest, most sustainable way possible — for yourself, your family and our planet — you’ll discover essential environmentally friendly practices for protecting our planet’s precious resources while providing for your family, community and beyond. So, if you have the heart, mind and will, but just need some easy-to-follow guidance… join us for 3 days of innovation at the no-cost Gardening & Homesteading Skills Summit, October 17-19, 2017 and discover how to grow more, shop less, and save the planet! 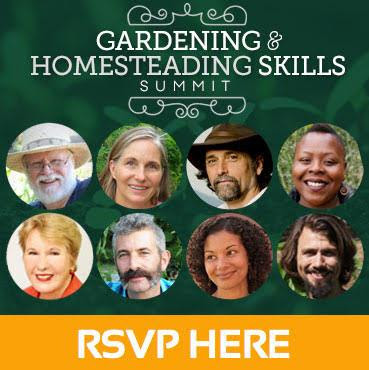 RSVP here for The Gardening & Homesteading Skills Summit — at no charge. Whether you’re interested in expanding your garden, starting an urban farm, living in right relationship with nature, or treating your family through natural medicine (or all of the above! )… there are sessions for you during The Gardening & Homesteading Skills Summit. Plus you’ll be in good hands for this first-ever online gathering with educator, gardener, beekeeper, artist and activist: host K. Ruby Blume, Founder and Headmistress of The Institute of Urban Homesteading. I hope you’ll join us for this “groundbreaking” event, which is the first time we’ve explored many of these areas that are essential for living in a healthy, eco-friendly way. For some of the teachers, this is the first time they have ever done an online summit so you’ll hear things that you haven’t been able to access in this way before. Join The Gardening & Homesteading Skills Summit here — at no charge.